73yo M w/ hx of CHF, A. Fib on coumadin and MV replacement with a porcine valve 1 month ago presenting with 2 weeks of worsening SOB, weight gain and peripheral edema. Pt presented to his PMD today for SOB and after an CXR showing cardiomegaly, was sent to the ED for further evaluation. He denies chest pain, coughs or additional complaints. CONST: NAD, WDWN. Pt is alert. EYES: PERRL, lids and conjunctivae nl. CV: Irregularly irregular. Distant heart sounds. Bilateral pitting edema. RESP: Normal rate and effort. No rales, wheezes or rhonchi. ABDOMEN: Soft, nondistended, nontender, no organomegaly, no pulsatile masses. Normal bowel sounds. EXTREMITIES: Nontender, normal ROM. Bilateral pitting edema in lower extremities. SKIN: Normal color, warm, no rashes. NEURO: AAOx3, CN II-XII intact. No motor or sensory deficits. 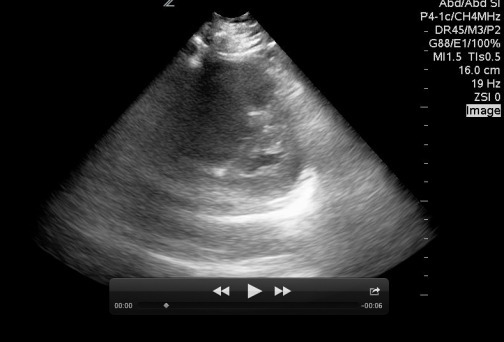 CXR: Moderately enlarged cardiomediastinal silhouette, slightly increased from 1 month ago. 1. What view are we looking at and what do you see on this view? 2. What view are we looking at and what do you see? 3. What concerning finding do you see in this image? What does it represent?